The material found in the catalogue includes the fruits of two research projects that have made this collection of images possible. The Imaging the Bible in Wales Project (2005-8) researched and recorded biblical art from Wales from the nineteenth and twentieth centuries, and much of this material was from places of worship in Wales. The project was funded by the AHRC and run by the Department of Theology and Religious Studies at the University of Wales, Lampeter (now University of Wales Trinity St David). For a broader selection of biblical art from Wales, please visit the Imaging the Bible in Wales Database. 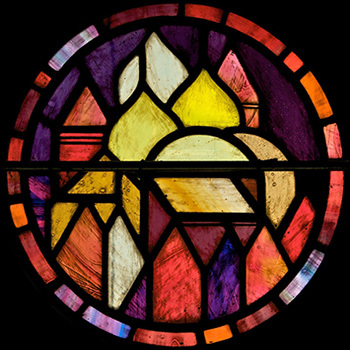 Subsequently the Stained Glass in Wales Project (2009-11) added many more examples and expanded the coverage of contemporary glass, as well as medieval examples. This was initially funded by the University of Wales Welsh Industries Fund and based at the University of Wales Centre for Advanced Welsh and Celtic Studies. Subsequent funding for additional material has generously been provided by the Pilgrim Trust, the Garfield Weston Foundation, the Friends of Friendless Churches, the Kempe Trust and the Glaziers' Trust. For a fuller description of the origin of the project and an overview of the contents of the Catalogue see the Feature in the February 2012 issue of Vidimus. Since the end of the Stained Glass in Wales Project in 2011 the main author of the resource, Martin Crampin, has continued to add some further material and additional information. In some cases this has been the result of people providing images and information, see the Can you help? page. Research for the book Stained Glass from Welsh Churches has also brought about an enormous amount of new research and photography, and it is hoped that in the future more of this will be added to these pages. All material on this website is protected by copyright law and users are reminded to respect the rights of copyright holders represented on the database. This means that the images on this website may not be reproduced in any form â€“Â in print or on any other website â€“ without permission, even for non-commercial, charitable and academic purposes. It is illegal to copy images and place them on a blog, Facebook, Pinterest, Wikipedia page or any other kind of website without permission. If you would like to do this please ask first. Use of images for private use and study is of course encouraged.